He had heard the rumblings for weeks. Paxton Lynch, a former first-round draft pick once regarded as the future of the franchise, was on the outs. 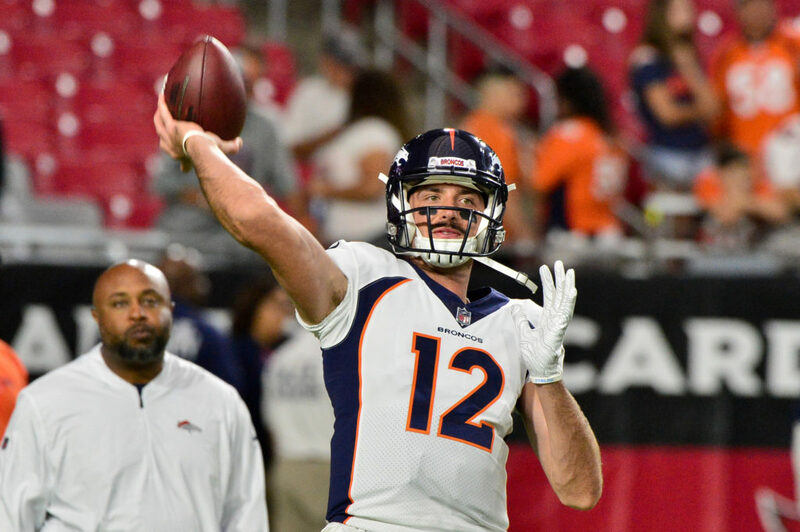 After losing the backup quarterback job to Chad Kelly earlier in the preseason, Lynch was set to lose his job on Saturday, when the Broncos were set to make their final roster cuts. Then, on Thursday, Lynch not only secured his spot on the roster, but likely sparked a new debate regarding which of the two should be the backup to starter Case Keenum. Lynch went 14-for-15 for 128 yards and a pair of touchdowns to lead the Broncos to victory over the Arizona Cardinals in the final game of the preseason, looking comfortable and in command throughout his second-half appearance. Make no mistake, Lynch was playing almost exclusively against defenders who will be looking for a new job on Saturday, but for a Broncos team that has been looking for any excuse to continue the experiment with the 6’7″ Memphis product, John Elway and Co. certainly found a plethora of them on Thursday night. Outside of an unwise interception, Kelly wasn’t bad, going 12-for-19 for 126 yards. He didn’t throw a touchdown, however, and pressed at times in his first-ever start. Running back De’Angelo Henderson once again made a strong case for the roster; running with power and purpose while churning out nearly five yards per carry, and practice squad candidate David Williams showed off multiple dimensions for the second week in a row. Wide receiver Jordan Leslie, who might have made the team in a normal year, hauled in five catches for 70 yards and a touchdown, and looked like he belonged. Thanks to the Broncos’ stacked receiving corps, Leslie’s best chance to make the team may be with the practice squad — assuming that no other team scoops him up. On defense, hybrid safety Su’a Cravens finally appeared on the field, and served notice with an array of punishing hits that the Broncos were hoping to see since they acquired him in the offseason. Cravens wasn’t even in pads after halftime, and his place on the roster seems entirely secure. The Broncos kick off the 2018 season in earnest against the Seattle Seahawks, and look to be improved over last season’s slow-motion, five-win trainwreck. They’ll cut down to their final, 53-man roster on Saturday, and if the Broncos were looking for answers regarding Lynch’s potential future with the team , they received two: Yes, he’ll be on the team. No, that still doesn’t mean that they have any idea what kind of player he’ll eventually become. For the Broncos and Lynch, each of the last three preseasons have ended the same way: with an “I don’t know” shrug, and with Lynch’s name on the roster.